https://www.facebook.com/photo.php?fbid=10215346574131029&set=pcb.10215346577171105&type=3&theater :-) I have made the link public... hope that works! I was there! Parked not far from the Jags and beside a purple Peugeot and a pale blue 1950's cruiser :-) Had lots of interest and good chat with lots of people. Was a fab day... except for the traffic at Otaki! Turns out the valve was getting jammed open due to gunk in the tubing; to totally resolve it would mean removing the turbo and taking the engine out to replace! Their suggestion was to disable and get the codes blocked. This was done by Prestige in Petone and all is going well... total cost including investigation work came $640. Called in to Armstrong this morning and they won't replace under the recall. It appears that although in the year range mine is not on the Vin register for replacement. Weird or what! $1700 for replacement! Eek! Very tidy! My first Subaru was a blue XT (reg MX9138); loved it! Had issues with the suspension but the local subbie dealer did a some magic to keep it going. Was an amazing car to sit in and drive... the electronic dash was fab and the 'joystick' transmission. Clocked up a fair few ks and fun in her. 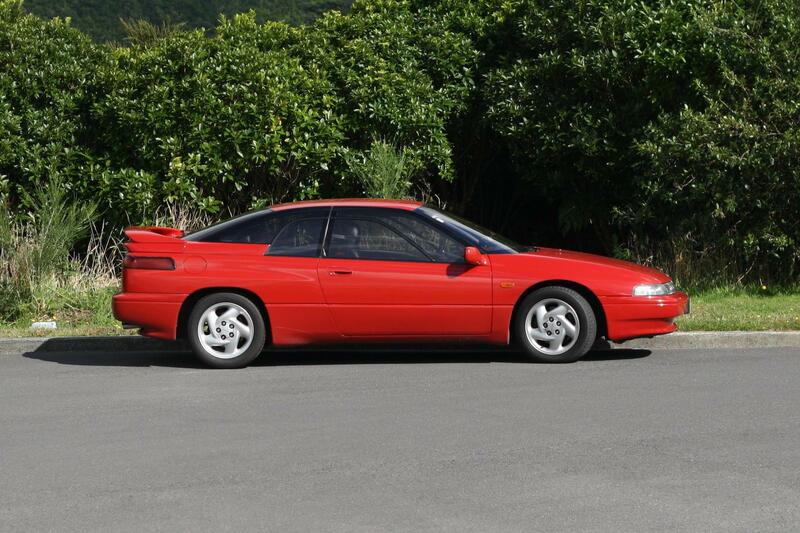 Had to sell her when circumstances changed :-( Just checked out the reg on CarJam…. deregistered in 2002 and off the road at 222,000km :-( Have a 95 SVX now 360,000km and love her too! Fingers crossed for many more years of enjoyment and pleasure out all of our cars! Booked in for lunch and the Trackday :-) Will probably come to Tui HQ in the Forester and the SVX for trackday. I don't think there is a crew such; myself and 'Feetup' are going down and meeting around 11'ish my contact is 021 255 1904 :-) I am not heading over to Masterton for skids. Here is info on costs: COSTS:At the Hardpark - $5 per car and a gold coin per passenger. If you want to be super cheap just jump out of the car before you are at the entry and walk into the venue. At the skid pad its $10 per person to get into masterton motorplex. $10 per car to have a skid, and if you want to be a passenger $10 to head out onto the skid pad. Burnouts are in Masterton here is the info from the facebook page: THE CONVOY: All it takes is for one person to stuff it up for all of us. Respect will need to be shown on the convoy, show some respect for yourself and other road users. Watch your following distances and be courteous to others. And if the convoy breaks up a lil that’s all good, there is no way we can keep that many cars in a single line anyway. Officials will be stationed along the way keeping an eye and stay on your side of the road over the Rimutaka hill road. Overtaking isn’t going to help you get there much faster either, if at all. IN A NUTSHELL: - For the Riverbank the Hardpark starts from 11am to 3pm - The convoy will leave from the riverbank carpark at 3pm - The skidpad is open to our use from 4pm to 7pm AT THE SKIDPAD: The amazing team at Masterton Motorplex is running the skidpad side so if they have anything to add we will post it up. For the guys skidding, you will need a helmet, your battery secure and to make sure your skid wheels don’t have wheel weights on them. You will also need proper shoes for the skidpad, jandals wont cut it. Each car will go though a quick scruitineer and from there you will line up to have a skid. Passengers will need appropriate footwear and a helmet too if they would want to go for a ride. There is an official list to skid, but on the day if you want to have a skid its $10 to get on the pad. It’s a non competition laid back environment, it’s all about getting out there and having fun. Thinking of taking the SVX down; is anyone else going? Thinking of coming up; last year was such fun! Will see if I can do one or both days. Alternator drive belt has failed and I'm in Christchurch and I'm in Christchurch. Is anyone able to help??? Please contact on 0212551904. I am stuck!!! HELP! Currently in Hornby. Forgot to add that vital piece of information. Discussed this recently with my mechanic and they said the same... stay away!